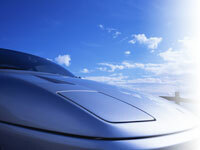 Introduced here are dry-type materials, such as textile fabrics and unidirectional (UD) base materials formed from thermoset resins using high-strength fiber. Besides carbon fiber, various textile fabrics using high-strength fiber, such as glass fiber, aramid fiber, and high-strength polyethylene fiber, are also available. 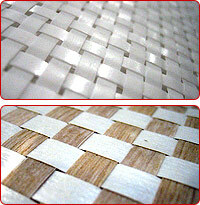 Regarding such materials as knits, mats, braids, spread fiber materials (specific thin-layer base materials), please see the respective corresponding introduction corners. This is a two-axial reinforced base material woven of carbon fiber, and is produced as a textile fabric ranging from regular to large toe. Some materials can be custom ordered so as to promptly provide only as much material as necessary.For more details, please contact us. Hybrid textiles are produced by weaving carbon, aramid, glass, and other high-strength fibers, to create fiber combinations for various applications. Unidirectional (UD) textiles array high-strength fibers in one direction to fully utilize the fiber's strength. Unidirectional (UD) knits, with draping characteristics, array high-strength fibers in one direction, held with knit fabric, to fully utilize the fiber's strength. Various kinds of materials other than textiles can be cross-formed (two-axial sheet). Cross-formed materials, such as well-balanced wide sheets, are utilized in various fields.